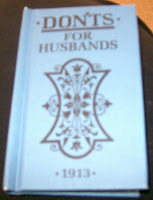 I came across this very small blue book called Don’ts for Husbands recently. 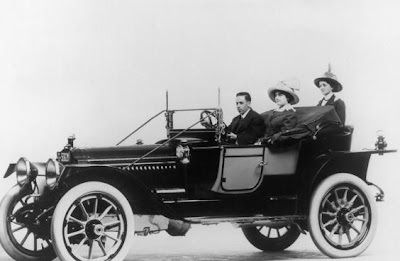 It was written by Blanche Ebbutt and was first published in London in 1913. There apparently is another one called Don’ts for Wives and I have that on order. The books were republished in 2007 as small pocket books and you can get them on Amazon. For anyone out there, male or female, who thinks we haven’t 'evolved' in the last 100 years then the following excerpts should prove an eye opener. It’s like another world. Imagine what our great grandchildren will be saying about us one day. Blanche offers the following advice to husbands regarding their 'general habits'. It’s a little humorous but we have to remember this was in the UK at a time when there were servants, when women did not work outside the home and the man was most definitely the master of the household. Who knows maybe it still reflects some households of today. 1.Don’t sit down for breakfast in your shirt sleeves in hot weather on the ground that only your wife is present. She is a woman like any other woman. The courtesies you give to womankind are her due, and she will appreciate them. 2.Don’t stoop if your work is desk work. Your wife wants to see you straight and broad chested. 3.Don’t keep all your best jokes for your men friends. Let your wife share them. 4.Don’t flourish a grimy handkerchief about because you have forgotten to take a clean one out of your box or your drawer. If your wife provides you with a reasonable stock, you might at least take the trouble to remember to use them. 5.Don’t look at things solely from a man’s point of view. Put yourself in your wife’s place and see how you would like some of the things she has to put up with. 6.Don’t sharpen pencils all over the house as you walk about. Try a hearth or a waste paper basket, or a newspaper. It does not improve either carpets or the servants temper to find scraps of pencil sharpenings all over the floors. 7.Don’t always refuse to go shopping with your wife. Of course it’s a nuisance, but sometimes she honestly wants your advice, and you ought to be pleased to give it. 8.Don’t be conceited about your good looks. It is more than probable that no-one but yourself is aware of them anyway. You are not responsible for them, and vanity in a man is ridiculous. 9.Don’t hang around the house all day if your occupation does not take you abroad. Spend regular hours in your study or den or go out and play golf, but don’t inflict your company on your wife during every minute of the day. She is fond of you but wants to be free sometimes. And she has business to do, if you haven’t. 10.Don’t delegate the carving to your wife. You should be ashamed if you can’t do a little thing like that. It is just laziness on your part. Besides a man ought to take the head of his own table. In future posts I will give you Blanche’s advice for personal relations, jealousy, finances, household matters, recreation and holidays, dress, hobbies, food and children. It get’s funnier. OK, ladies and gents, does any of Blanche’s advice to men in 1913 still apply in 2008? Maybe 3, 5 and 7? Absolutely number 7 - these are gems Lilly ! Very funny but true ! I look forward to more from Blanche. I'd say not much has changed. Mrs Fussy would love these and the league of extraordinary women would love these tips.